So, I said I was going to be patient. 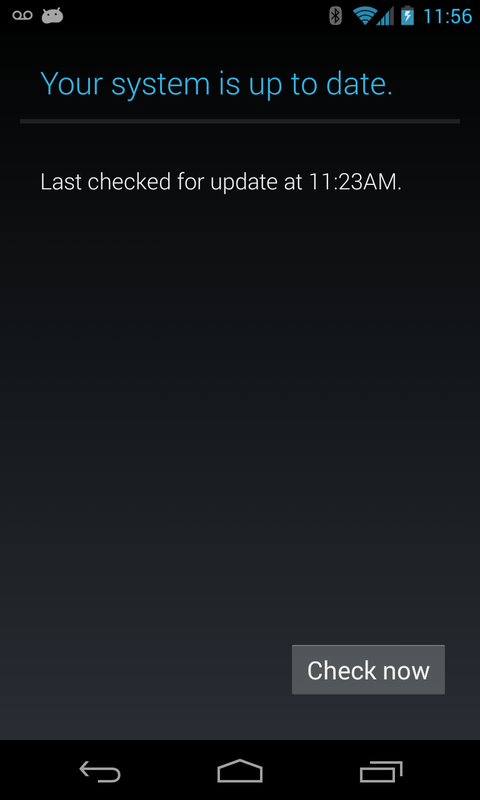 I was going to wait for the OTA update for my Nexus 4. After all, it's a Nexus, it should get the update soon. Well, after checking the 'check now' button for a whole week I turned on my phone last night and it said "system update downloaded". All I had to do was sit back and let it reboot to get the new update, no? As it turns out because my device was rooted and had a custom recovery, for some reason it failed. Weird. I noticed after the reboot that CWM was stating that it was an untrusted update and it just failed. So I downloaded the OTA update files and figured I'd just flash that. Good right? Well... no. CWM would say it failed, and that there was some error or something. I tried 'adb sideload', same deal. Something wasn't right. Whether it was a CWM issue or the fact that maybe there was something wrong with my image file that it needed to check against before applying the patch... either way, I wasn't getting 4.3 the 'easy' way. Great article there +Android Police and +Artem Russakovskii! Read it over, it's got everything you need! I had to go with scenario 2 as my OTA failed. Make sure you have the AndroidSDK so you have the whole 'adb' and 'fastboot' commands. Also, you'll need to have your device 'trusted'. I'm assuming you've done that, because, this is for 'rooted' users already. Extract all the files (with 7zip I had to extract the tgz file to get the tar file, extract the tar file to get all the stuff you need). Then just use the commands they list in scenario 2, step 3. Then just flash the SuperSU file. 4.3 and still rooted, no loss of your info and you now have TWRP as recovery. All in all, took me maybe 15 minutes.